Some might call SoleVita and RhetOracle a creative match made in heaven. These contemporary jazz dance companies both thrive on athleticism, entertaining narratives, and showstopper appeal. This past weekend’s show, The Great American Mixtape, featured a full, two hours of nonstop, high-energy dance. Here is an account of my favorites of the night. 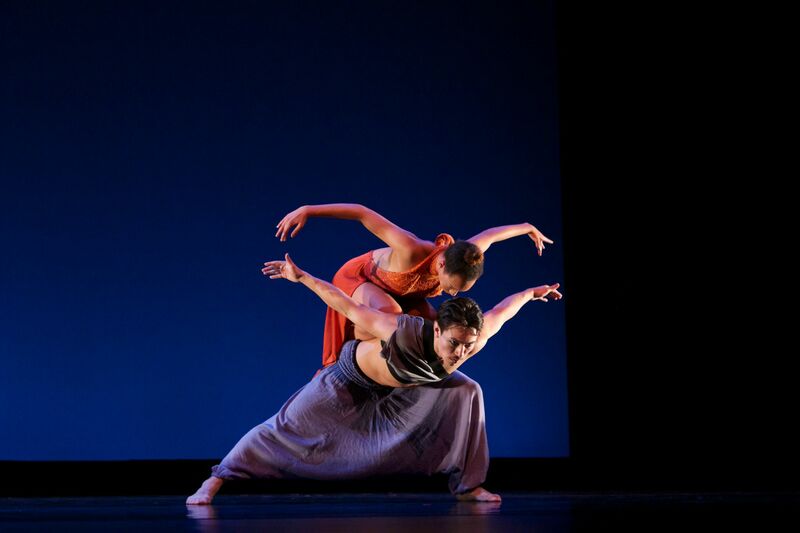 SoleVita’s Stealing Away, choreographed by artistic director Joelle Martinec, was a compelling love duet featuring Amber Dupuy and Isaac Huerta. The movement invention of this work was particularly captivating as the dancers rolled into each other and over each other in surprising configurations of torsos and limbs. The pair of dancers was well matched physically and emotionally making this an excellent example of contemporary jazz that was rock solid, passionate and captivating. RhetOracle’s fearLESS, choreographed by long-time company member Rochelle Mapes, started simple and expanded into a stage bursting with layers as waves of bodies swept over each other in a dynamic display. The costumes of simple red shirts and grey shorts kept the design of the piece clean and uncluttered. Mapes’ sense of compositional texture is what made this piece so splendid. The final image of the dancer free-falling into a void captured a sense of vulnerability that balanced the detailed craftsmanship of the piece as whole. 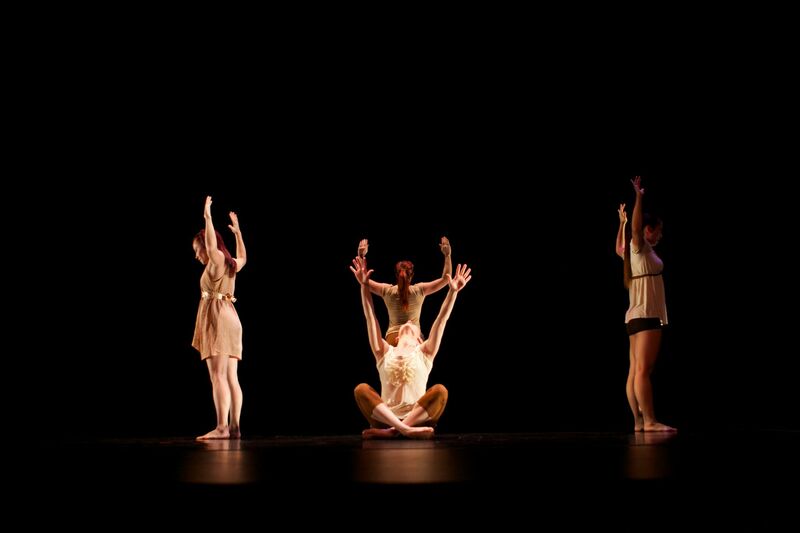 Martinec’s small ensemble work, Divine in Nature, was the most modern influenced piece of the evening. The quartet of regal women embodied power and femininity in a timeless world. The surprising addition of a male figure half-way into the piece created a sense of dramatic tension that further fueled the narrative. The male character, performed by aforementioned Huerta, commanded the stage, arriving to the goddess world with strength and masculinity. The dancers’ elegant shapes, combined with the warm color pallet and earthy music, mesmerized me into a state of near hypnosis. The arc of the dance, including an elegant duet between Huerta and Lindsey Fletcher, was well crafted and well paced. However, the sudden pairing of Huerta with another female at the end of the piece left me uncertain and a bit unsettled in this world I felt I knew and understood. Artistic director of RhetOracle, Nate Hodges, choreographed the Act I closer entitled The Nymphs. This piece was pure silliness. However, its silly story of four men chasing love in the form of garden nymphs was anything but silly in its challenging movement vocabulary. Petite allegro is one of the great feats within classical dance technique, and this piece was build on jetés, ballonnés, and pas de chats. This fast footwork (embedded with all of its challenges) was what allowed the whimsy and humor of this piece to work so well. Yes, it was silly. It was ridiculous! But, behind every ridiculous moment, there was a challenging air work sequence that could humble any dancer. The strength of the dancer’s technique created the necessary foundation for the characterizations and comic timing that was laugh out loud. Another piece by RhetOracle’s Hodges, La Destreza, demonstrated a different side of his choreographic voice. This trio of women was also highly theatrical, however the startling inclusion of broadswords (two per dancer) and blindfolds made this dance one of the biggest choreographic risks of the evening. While I know that blindfolds on stage are rarely completely obscure, even the most transparent fabric will challenge a dancer under glaring stage lights. These women engaged in highly stylized dance-combat with swords that were clearly real metal and likely very heavy and cumbersome. This type of piece is not one that can be easily thrown together; the choreographer and dancers must carefully calculate for all of the physical risks of the work. But, these risks seemed worth the effort as it earned a hearty applause. Martinec stretched her conceptual muscle in her time-warping work, Future Hindsight. This ensemble piece began at the end. Dancers first performed movement in sequences that seemed somehow awkward to music that was strangely dissonant but familiar. Quickly, one realized that they were dancing in retrograde. What a brilliant way to engage the audience into the narrative of a work! The dancers performed in duets, then groups, then duets, configuring and reconfiguring with each other in such a way that I found myself rewinding the rewind in my head to try to piece together what happened. When the dancers shifted gears into real time (and into forward motion), the audience saw the raveling of the unraveled story, a love triangle gone amiss. The use of retrograde as a choreographic device allowed a common dance narrative to have new life with renewed engagement from its audience. It was a smart twist that yielded a sweet reward. The show as a whole featured fifteen different works including an empowering female ensemble work by Bri Allard Blonigan entitled Per Her Missions Lips; a theatrical and very funny duet, First Love, by Courtney Ozovek; a carefree ensemble work, The Garden, by Bryana Zaragoza; and choreographic contributions by Amber Dupuy in the excerpts from Real Eyes. While each dance was entertaining, the show as a whole may have been better served with a slightly shorter program featuring the works with the greatest variety or distinct movement palettes. As it was, the repetition in casting and similar themes caused a few of the pieces to blur together in my memory. Nevertheless, the standouts were exactly that, standing out in their use of compositional textures, movement innovation, musicality and narrative. Having seen both companies before, I had an idea of what tonight’s show might be like. What I hadn’t anticipated was the incredible growth of the veteran performers from past seasons. It is a reminder that, as choreographers refine their voices, the dancers often grow in equal measure, learning to perform with an increased sense of clarity and refinement that suits the creative demands of a mature choreographer. Both SoleVita and RhetOracle serve as dance companies who strive to bridge the familiar contemporary jazz dance aesthetic seen on television dance shows to a more concert oriented, conceptually driven dance practice. Their work embraces the youthful energy and athleticism of commercial dance, but extends into slightly longer works with additional compositional and conceptual development. For audience members who are otherwise unfamiliar with concert dance, these two companies extend an invitation into the often misunderstood concert dance world and thus carry a huge responsibility to the field of dance as they serve as guides from one arena into the other.